For students searching for a great Cuban restaurant, look no further! 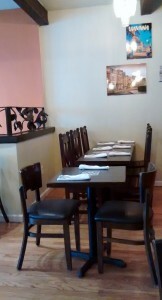 Varadero Cuban Cuisine has opened up in the heart of the East Village. The restaurant recently underwent a major renovation and now offers a welcoming ambiance paired off with delicious food and drinks. I really enjoyed the atmosphere of the restaurant. My friend and I visited during dinnertime. All of the doors were open to let in the natural lighting. So it felt a bit like an open air café. Very inviting. Overall, the restaurant had a really relaxed vibe. It was quiet and welcoming. 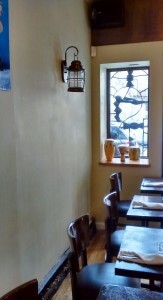 Varadero’s owner, Manny, explained that the original restaurant needed a lot of work; a complete renovation. He wanted to create a new face for the restaurant. The renovations began in early January and Varadero was finally open for business a few months later! 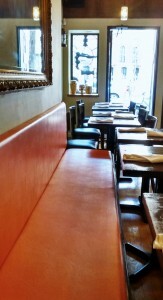 Now the restaurant is much more beautiful and open! The windows provide a great deal of natural lighting and the benches along the wall are nice and comfy. There is also a bar in the corner where you can sit and enjoy a drink or two. The meals were also very filling and homey. They offer a great, authentic taste of Latin America. 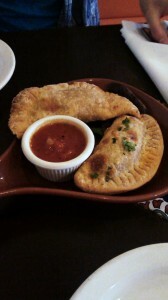 For the appetizer, my friend and I ordered both the chicken and beef empanadas. Empanadas are my favorite and these were very good. The crust was flaky and the meat inside was really tender and juicy. For the entrée, my friend and I both ordered the recommendations from the waiter. 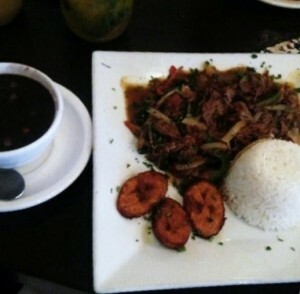 My friend had the Ropa Vieja, which is shredded skirt steak with sauce and vegetables. It came with white rice, black beans and plantains. I love plantains, so it was a nice treat to get them. Their sweetness balanced well with the more salty beef and savory sauce. Thanks to the waiter’s recommendation, I ordered the tilapia. 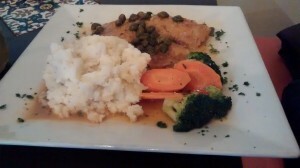 It came with a lemon and capers sauce. I’m not a huge fan of capers and found them to be pretty salty. I’d never had capers before, so I wanted to try them out. But you can order the meal without capers! If you’re not a huge fan of salt, I would recommend that. But otherwise, the fish was really delicious. It came with vegetables and mashed potatoes. The potatoes were light and fluffy. The meal was very filling overall. My friend and I also got drinks! We were going to order the sangria because it is supposed to be very good, but we decided to try the mojitos instead. They really good, strong, and refreshing. 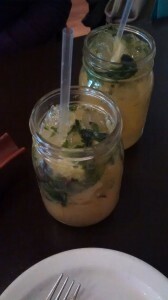 I got the passion fruit sake mojito and my friend got the mango mojito. The mango tasted so good. The fruity taste blended well with the mint. The drinks also came in mason jars, which I thought was a really nice touch. The restaurant also has happy hour Monday-Friday from 4-8pm, where the drinks are only four dollars! They also have live Latin music on Saturday evenings, which is awesome. 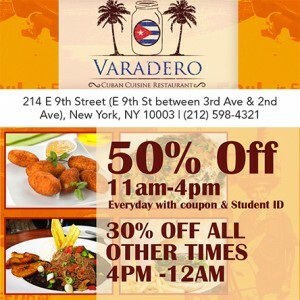 Varadero will also be offering great discounts for college students! Students get 50% their meal from 11am-4pm and 30% off all other times. You can download the coupon from the Campus Clipper website here. So whether you’re stopping by for the drinks, the food, or the live music, Varadero Cuban Cuisine should be your first stop in the East Village!